In Matthew 18:1-9, Jesus spoke about little children and how precious they are in the Kingdom of God. This same verse can also be found in the other Synoptic Gospels [Mark 9:42, Luke 17:2]. In this study, we will examine who the little ones are, and what it means to stumble them. If anyone causes one of these little ones–those who believe in me – the context is clear. If anyone, whether believer or not, causes a child – and this only applies to believing children – to sin. Little ones – or children – here could be taken literally or metaphorically. Some argue that it is unfair to take this literally as seldom will you find a child who seriously believes in the gospel – with sufficient understanding of what they are believing in, and hence this may suggest people who are little in their own eyes, or young in the faith. It must be noted that Jesus called a little child and had him stand among them in verse 2 as an example and a prelude to this passage. So whether this applies to the metaphorical children (young in faith and little in their own eyes) or not, we must surely assume it applies to normal children (by age). to stumble – How do we stumble people? It is easy, isn’t it? To hinder their faith, to withhold the faith and the gospel from them, to intentionally not teach them about the gospel, or to teach a misleading gospel. To discourage their ministry, to dispute their actions, to pick on their words, to pour water on their passion. To cause them to quit serving the Lord, to cause them to leave the fellowship of believers, to cause them to be bitter against God. It happens, whether we do it intentionally or not. Woe to the world because of the things that cause people to stumble! Such things must come, but woe to the person through whom they come! [Matthew 18:7, Luke 17:1|Article]. have a large millstone hung around their neck and to be drowned in the depths of the sea – a millstone, in the context of those days, was a pair of stones put together to form a circle, used to grind grains and wheat. It is huge, it is thick, it is very heavy. To have a millstone hung around one’s neck is like having a huge burden. You would scarcely be able to stand, much less walk or run around freely. You’re bound to it, imprisoned to it, slave to it. That is the price of stumbling God’s little children – but that’s not even half of the punishment. While having a large millstone around one’s neck is a massive punishment by itself already, the purpose of this millstone isn’t to enslave you, or to bind you. The purpose is to throw you into the sea and to drown you. There is no way you will not be drowned, due to the sheer weight of the millstone. it would be better for them – drowning is not a nice way to die. It takes a bit of struggle, and your corpse looks awful as a result. Yet, even with such a heavy punishment, Jesus said, it would be better for them to be drowned. 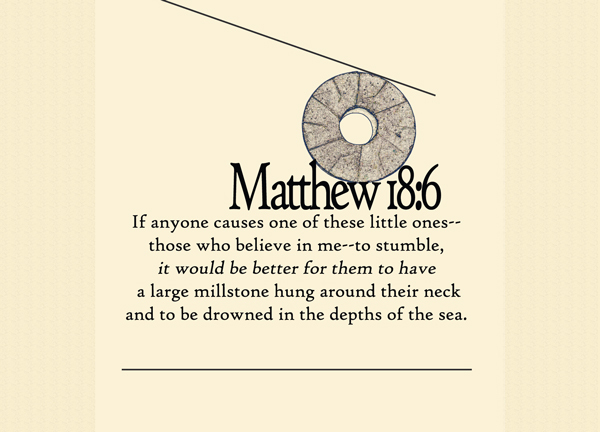 Quite frankly, we all know that many people have stumbled little ones before, but none of them have received a millstone around their necks and got thrown into the depths of the sea to be drowned. Jesus spelt out a terrible punishment such as this to illustrate the extent of how badly it was frowned upon in the Kingdom of God. But the true consequences, we do not know – only God knows. But when Jesus tried to give us a picture to understand the extent, he said, it would be better for them to be drowned. It would be better. Why? Because the actual consequences for that person, would be much worse than drowning. Perhaps not in this life, but in the eternal life. Have you stumbled anybody? It is not hard to stumble people – sometimes we don’t do it intentionally, but we end up doing it very seriously. Sometimes we don’t even realise we do it – many of us underestimate our spheres of influence and how much people around us get affected by us. Especially the little ones, who would not be able to hold an argument against adults and win, who would not be able to articulate – no, this is wrong. Who may not have sufficient knowledge about the Bible to not be led astray. Who will not know the word of the Lord if they are not taught. We need to teach the little ones the word of God. Start children off on the way they should go, and even when they are old they will not turn from it [Proverbs 22:6|Article]. It is our role and our responsibilities. Even metaphorically – we need to encourage those who think little of themselves, and we need to nurture the spiritual growth of the young and new believers. Once upon a time, when we were still young (in age, or in the faith), perhaps there were few who helped us out, that we became who we are today. It is God’s grace. But the same goes, today. Let us lend them our shoulder, that they can one day stand upon it.